Most tourists assuming that hotels are the only option once they arrive in Lefkada. But the truth is there is always economical holiday accommodation. The most wanted the past years are the holiday apartments or hotelaparts. Aristea Lefkada Apartments are the option in Lefkada with cheap holidays apartments for rent in Nikiana for your Greek Holidays. 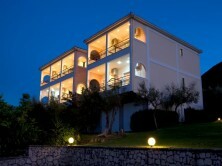 Aristea Lefkada Apartments are in a spectacular place near Nikiana in the island of Lefkada. The surrounding environment is among the trees and we have a spectacular view to enjoy at the Ionian sea. Facilities that you can see in our website and beautiful apartments to accommodate. Aristea Lefkada apartments at Nikiana is a complex of 10 comfortable apartments that can accommodate you for your Summer Holidays in Greece. The apartments have a bedroom, a bathroom and a living-room. Kitchen is in the living room with all the necessities for your holidays!